Thomas Fred Lipscomb, 78, died October 14, 2018 at home in Memphis, TN. He was born in Houston, TX to the late Norris Ivy Lipscomb and Leon Brewer Lipscomb. He attended Lamar High School and Sam Houston State University where he was a member of Sigma Phi Epsilon Fraternity. He graduated from Hull School of Aviation and was an airline pilot 31 years with Southern Airways which then became Republic Airlines and finally Northwest Airlines. He was a member of the Rotary Club of Hernando, volunteered with Community Foundation of North Mississippi and went on multiple mission trips to Honduras with Living Waters Mission. He enjoyed attending NASCAR races, riding motorcycles, snow skiing, hunting, camping and most of all, flying. 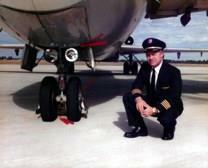 He enjoyed monthly luncheons with other retired pilots and enjoyed spending time with friends. He also owned and operated a farm for many years in Abbeville, MS. He is survived by his daughter Michelle Lipscomb (Gary Hutcherson), his son Thomas Lipscomb, Jr (Holly), grandchildren Cameron Dooley, Henry Lipscomb and John Lipscomb, his brother Norris "Bubba" Lipscomb and his special friend , Gladys Jenkins. Funeral services will be held Friday, October 19, 2018 at 2:00pm at Hernando United Methodist Church, 1890 Mt. Pleasant Rd in Hernando, MS with visitation beginning at 1:00pm. He will be laid to rest in Hempstead, TX. In Lieu of flowers the family requests that donations be made to Rotary Club of Hernando, MS "Honduras Water Well" P.O Box 231 Hernando, MS 38632 or Hernando Methodist Church. Share your memories or express your condolences by signing the Guest Book below or click here for entry suggestions. Share photos, videos and more with Legacy Memorial Websites. Find out more.